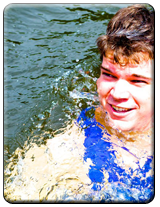 Lifejackets: Delaware River Tubing, Inc. offers free lifejacket rentals for all river trips. All participants must wear their life jackets for the entire river trip. Safety is our number one priority for all of our guests. Refunds: Delaware River Tubing, Inc. will issue refunds only in the event that you paid or pre-paid prior to entering the river and choose not to go for any reason. However, once you enter the river, there will be no refunds issued for any reason. If you miss or choose not to stop at The Famous River Hot Dog Man, a refund will not be issued because there is no charge for the free bbq meal. It is up to you to stop if you wish to redeem your meal wristband. Signs and briefings will further explain how to get to The Famous River Hot Dog Man. 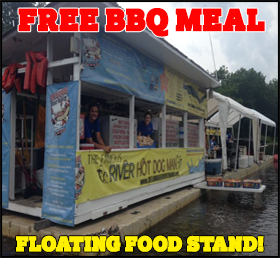 Free BBQ Meal: The Free BBQ meal is a free meal provided by “The Famous River Hot Dog Man". Delaware River Tubing, Inc. does not offer a “no meal option”. If you miss the food stop or choose not to stop, there will be no credit or refunds given. Inclement Weather: Delaware River Tubing, Inc. reserves the right to close due to inclement weather. Check the weather conditions for Milford, NJ (08848) prior to coming. If there is a possibility of thunder or lightening, please call us in advance to check if we are open or closed. We suggest that your group have a rain date scheduled in the event of rain. If it begins to rain, thunder, or lightening while you are on your trip, there will be no refunds issued. We do not control the weather and cannot be held responsible if it begins to rain during your outing. Plan accordingly and make the best decision. High Water (Flooding): For your safety, in the event of flood conditions, we will be forced to close. The Famous River Hot Dog Man will be closed when the river is 4' above normal (6' Reigelsville, NJ reading). Once the water is 6 feet above normal water height (8' Reigelsville, NJ reading), we will stop our operations until the water level is below 6 feet and safe to enter. Equipment: Tubes and rafts are typically available for walk-in guests. For a canoe or kayak rental, please call us with your inquiry. A reservation helps us be prepared for the day in terms of staffing and supplies. Sorry, we no longer provide transportation to private recreationalists. 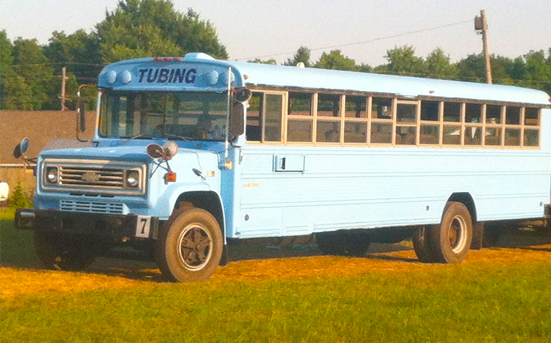 You must rent equipment from Delaware River Tubing, Inc. to use our transportation services. No exceptions! Equipment is inspected prior to customer usage. Customers who intentionally damage equipment will be charged for the damaged equipment. For natural equipment wear and tear usage (ie.  tube/raft deflation, etc), we will do our best to quickly swap that equipment. Food and Coolers: Food and Coolers are strictly forbidden. 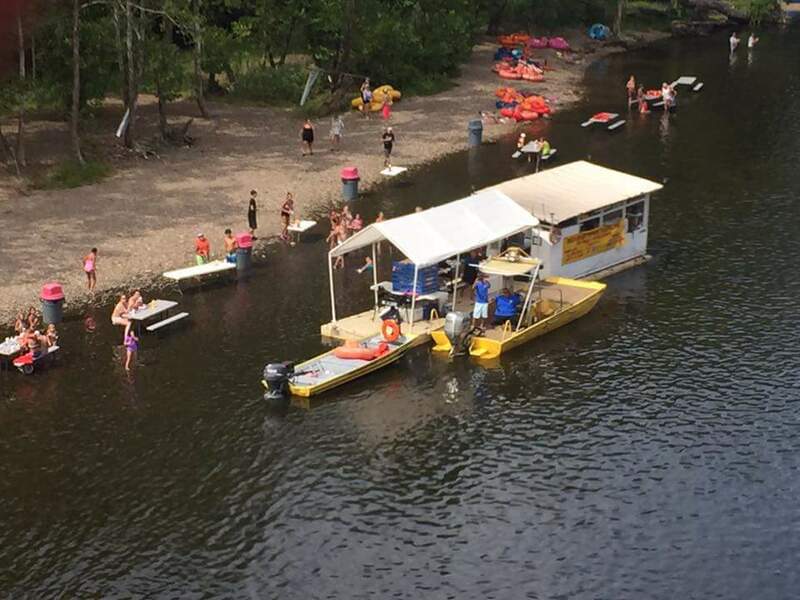 The river rental includes a free BBQ meal at “The Famous River Hot Dog Man”. Sealed water bottles are permitted. If you have any dietary needs, we will make exceptions, but must be notified prior to your trip. 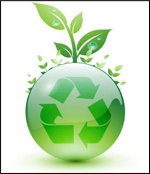 To prevent littering and to preserve the environment, Delaware River Tubing, Inc. does not allow food or coolers. Alcohol: Alcohol is strictly forbidden. Alcohol and water sports do not mix. If you are caught drinking alcohol on our property, you will not be allowed to participate. Please understand that your safety and the safety of others is our number one concern. Illegal Drugs: Any person suspected with or caught using illegal drugs before departure will not be allowed on the ride. If you are suspected of being under the influence of any drug, Delaware River Tubing reserves the right to deny you of participating for your safety. Dress Code: Delaware River Tubing, Inc. is dedicated to providing a fun, safe experience. Keep in mind that this is a water ride and you will get wet. Please dress approapriately, as this is a family oriented operation. We highly recommend wearing swim wear. Footwear is mandatory to participate because of the rough and rocky riverbed. Open toed footwear, such as flip-flops, are not acceptable footwear. We offer proper footwear at our River Store when you arrive. Personal Articles: Delaware River Tubing, Inc. takes no liability for lost, stolen, or misplaced personal items. We recommend that you leave all valuables at home or hidden in your locked vehicle. We offer a free key check for your convenience. Personal Equipment (Tubes, Rafts, Canoes, Kayaks, etc): Delaware River Tubing, Inc. can no longer allow the use of personal river equipment or life jackets. Our insurance policy no longer covers personal equipment and we will not transport private equipment. If you are caught with your own equipment, you will not be allowed to enter our property or shuttle buses. We thank you for understanding. Pets: All pets are not allowed for the safety of our customers and to help protect our equipment from damage. Pet nails commonly "pop" tubes and rafts, and scratch canoes and kayaks. Furthermore, Delaware River Tubing, Inc. will not pet-sit and if you bring your pet and leave your pet in your car unattended, we will notify the proper authorities. 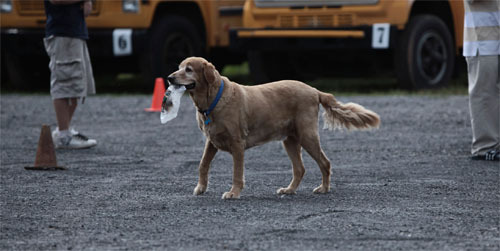 Leave your pet at home, but if you bring your pet on our property, Delaware River Tubing will not be liable for any damage or injuries that occur due to your pet. Age Requirements: The minimum age requirement to participate is 4 years old. Anyone under 18 years of age must have a parent or adult guardian that is 21 years of age or older accompany them on all river trips. Parking: Parking is now free and included! Sun Protection: We highly recommend the use of sun tan lotion/spray for your 3-4 hour trip. 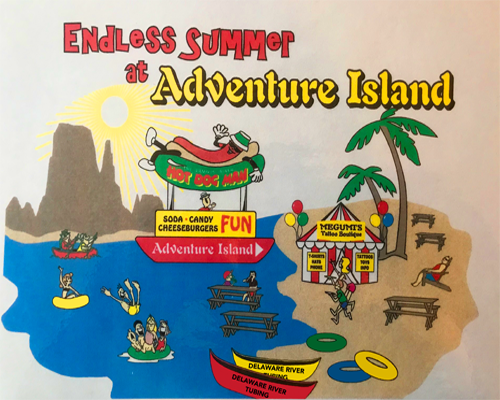 Delaware River Tubing, Inc. does not provide sun tan lotion, however we do sell sun tan lotion at our River Store. Inherit Risks: Delaware River Tubing, Inc. is not responsible for any injuries. Please be aware that this is an un-guided trip on a natural waterway with inherit risks. 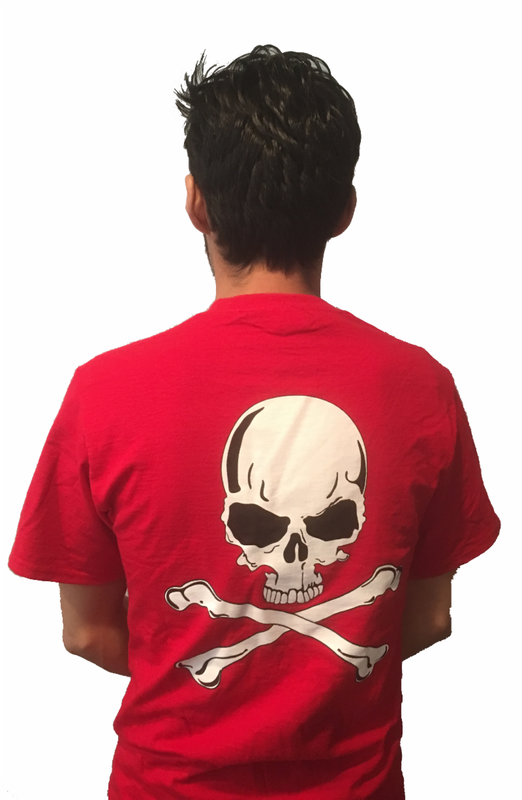 Risks include and are not limited to: Sun burn, sun poisoning, heat stroke, dehydration, cuts, bruises, scrapes, allergic reactions, fractures, dislocations, broken limbs, and drowning/death. There are no life guards on duty. Prior to your outing, you must fill out a waiver and release of liability form for each participant. Anyone under 18 years of age must have a guardian 21+ with them to participate. Participant Restrictions: We do not allow individuals to participate if they cannot swim, are pregnant, are on any prescribed medications, have heart or lung conditions, are under the influence of any drug or alcohol, or are under the age of four (4). Language and Conduct: Anyone caught using offensive language or acting inappropriately will not be permitted to ride. Offensive language or behavior will not be tolerated. Please remember that this is a family oriented business. Anyone that raises their voice or cannot control their temper will be asked to leave the premises immediately. Those that do not leave when asked will be charged with trespassing and law enforcement will be notified. Delaware River Tubing has a zero tolerance policy to miscreant behavior. Coupons: Coupons are limited to one per transaction and cannot be combined with any other offers. You must present the coupon to the cashier to redeem the special promotion. Coupons that are expired will not be accepted. Coupons that are valid for weekdays may not be used on weekends. Filming and Photography: Please be aware that Delaware River Tubing will occasionally be videotaping (filming) and taking pictures for our website, videos, and/or promotional uses while you are on the property or the river. If this is a problem, please do not participate. On days that we will film or take pictures, a notice will be placed at the check-in window to notify customers. IF YOU DO NOT AGREE WITH ANY POLICY OR THE POLICIES, DO NOT PARTICIPATE! IF YOU ARE CAUGHT VIOLATING ANY OF OUR POLICIES, YOU WILL NOT BE PERMITTED TO PARTICIPATE. 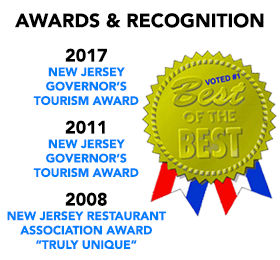 BY ENTERING THE RIVER, YOU ARE VOLUNTARILY ACCEPTING ALL OF DELAWARE RIVER TUBING, INC. POLICIES AND ARE ACKNOWLEDGING THAT YOU HAVE FULLY READ AND UNDERSTOOD THE POLICIES AND PROCEDURES. FURTHERMORE, YOU UNDERSTAND THAT THIS TRIP IS NON-GUIDED AND YOU ARE ENTERING AT YOUR OWN RISK. IF YOU HAVE ANY QUESTIONS IN REGARDS TO OUR POLICIES, PLEASE SEND YOUR INQUIRIES TO US BY EMAIL.